Time of Origin: Distant future, the planet Mechanus; exact time unspecified. Appearances: "The Chase" and "The Juggernauts"
History: Although essentially robots designed for a specific function on a human colony at first, the Mechanoids went on to become an interesting threat to The Doctor, although it is important to note that they were originally only his enemies due to a programming oversight rather than deliberate malice. The Mechanoids were created to protect the human colonists on the planet Mechanus, a jungle planet with massive mushroom-like plants called ‘fungoids’ capabile of independent motion, the city being balanced on stilts 1 500 feet above the ground, but the Mechanoids were abandoned when the colony never received any inhabitants due to Earth being caught up in interplanetary wars, leaving no opportunity for colonisation. The planet remained uninhabited for some time afterwards until space pilot Steven Taylor crash-landed on the planet, where the Mechanoids took him for analysis as he lacked the code that the colonists would have used to identify themselves. After being trapped on the planet for two years, Steven was rescued when the First Doctor, Barbara Wright, Ian Chesterton and Vicki landed on Mechanus while attempting to evade the Daleks, who were currently pursuing the TARDIS in their own time-travel machine ("The Chase"). Having survived the swamps of Mechanus and retreated to the city to escape the attacking Daleks, The Doctor and his companions learned what had happened in the colony from Steven shortly before the Daleks arrived. As the Daleks and the Mechanoids clashed, the resulting battle destroyed both sides and the city, giving The Doctor and his friends time to climb down the support struts of the city and return to the planet surface, Ian and Barbara using the Dalek time machine to return home while The Doctor and Vicki departed with Steven as their new companion ("The Time Meddler"). After five lifetimes, the Sixth Doctor encountered the Mechanoids again, although on this occasion they had been modified by Davros, the creator of the Daleks ("Genesis of the Daleks"), as part of his plans for revenge against his creations. After Davros was captured by the Daleks and taken back to Skaro to be put on trial for crimes against the Dalek Race ("Revelation of the Daleks"), the ship he was on was attacked and crashed on the doomed mining colony Lethe. With Davros the only survivor of the crash, and his identity initially concealed due to the injuries he had sustained, Davros was able to use an engineered virus to make the colonists perceive him as simply an old man in a wheelchair and assumed the alias of Doctor Vaso, subsequently creating the ultimate anti-Dalek weapons by adding human nervous tissue to the Mechanoids after they were discovered among excavations of previous colonies on the planet. Renaming the redesigned Mechanoids the ‘Juggernauts’, Davros turned them into the ultimate anti-Dalek weapon, making them self-repairable as long as the right resources were available. As an interesting coincidence, Davros was aided in their programming by none other than The Doctor’s companion Melanie Bush, who had become separated from The Doctor after the medical spaceship they were on was attacked and Mel was forced to leave in an escape pod. While Mel made a life for herself on Lethe, working with ‘Vaso’ to complete the Juggernaut despite outside attempts to take control of the program, The Doctor was captured by the Daleks to help them find Davros, as Lethe’s atmosphere contained an anti-Dalek toxin that was harmless to humans. Having identified Vaso as Davros, The Doctor learned about his work on the Juggernauts, quickly recognising them as Mechanoids rather than the new Daleks he had expected Davros to be creating. Although Davros told The Doctor that he was genuinely interested in atoning or his past, assuring him that the Juggernauts would revert to their default programming as terraforming robots after the Daleks had been eliminated, his use of living human subjects to provide the necessary nervous tissue - complete with a personality print wipe so that the Juggernauts had no trace of their original identities - proved to The Doctor that Davros hadn’t changed, forcing him to call in the Daleks to battle the Juggernauts. Outraged at Davros’s true nature, Mel activated a backdoor she had installed in the Juggernaut program that allowed her to take control of the Juggernauts, allowing her and The Doctor to escape a Juggernaut that was escorting them to a cell to investigate and sabotage the Juggernaut manufacturing facility. 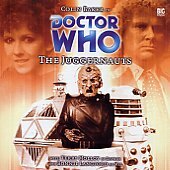 With the Daleks and the Juggernauts now facing each other, and Davros revealed as the monster he had always been when he ordered the Juggernauts to kill the escaping colonists, Mel used her backdoor code to order the Juggernauts to perceive Davros as a threat. As the Daleks and Juggernauts fell fighting each other, Davros’s self-destruct system was activated as a result of the damage that his chair had sustained, forcing The Doctor and Mel to flee to the TARDIS before the subsequent explosion wiped out the colony (Although Davros survived under unspecified circumstances).